Our goal is to connect people with the best local experts. We scored home appliance repairmen on more than 25 variables across five categories, and analysed the results to give you a hand-picked list of the best home appliance repairmen in Phoenix, AZ. Since 1987, Appliance Repair 4 Less has been serving customers valley wide. It believes that appliances aren’t made the way they used to be, and that repairing your existing appliances is usually the best option. The company repairs built-in appliances, KitchenAid, Whirlpool, Subzero, GE Monogram, and Viking appliances. All technicians undergo a criminal background check and drug test. There is no extra charge for service calls on weekends or after hours, and no trip charge for customers in Phoenix, Scottsdale, or Maricopa County. All parts and labor come with a one-year warranty. Appliance Works is a family owned and operated appliance repair company that offers personalized service and competitive prices. Its highly trained technicians work on refrigerators, washers, dryers, dishwashers, ranges, ovens, microwaves, and ice makers. Some of the brands they repair include Whirlpool, GE, Kenmore, Amana, Maytag, KitchenAid, Jenn-air, Roper, LG, Hotpoint, Frigidaire, and Electrolux. The company is accredited by the Better Business Bureau and a Phoenix Chapter Member of NARPM. Appliance Works serves the greater Phoenix area, including Scottsdale, Tempe, Chandler, Mesa, Gilbert, Glendale, and the surrounding areas. The licensed and certified technicians at Arizona Appliance Repair has more than 15 years of professional experience and strive to complete all service calls on the same day. The team specializes in repairs for home appliances, refrigerators, freezers, ice makers, washers, dryers, ranges, dishwashers, ovens, and vents. They only install new, manufacturer recommended parts and do not perform repairs without prior approval. Arizona Appliance Repair operates throughout the Phoenix Metro area, including Scottsdale, Paradise Valley, Tempe, and Mesa. Avondale Appliance Repair serves Phoenix, Avondale, Goodyear, Peoria, Litchfield Park, Sun City Grant, Sun City West, and Glendale. It offers same-day repairs, high-quality factory-specified parts, and offers a discount for scheduling online. Weekend appointments are available. The company specializes in repairing major brands and models of stoves, refrigerators, dishwashers, washers, and dryers. Family-owned and operated Elite Appliance Repair is based in Glendale and services most of the Phoenix Valley. The company offers same-day service, and the service call is free with recommended repairs. Its qualified technicians have more than 10 years of experience and can repair all major brands and all major appliances. Most refrigerator repairs are done on the same day. All repairs come with a warranty. The service area includes Avondale, Buckeye, El Mirage, Glendale, Goodyear, Laveen, Litchfield Park, Paradise Valley, Peoria, Phoenix, Scottsdale, Sun City, Sun City West, Surprise, Waddell, and Youngtown. Located in Avondale, Gabriel’s Appliance Service offers fast, reliable repair of most appliances at affordable prices. In addition, its knowledgeable staff is happy to answer any questions about your appliance on the phone or in person. The company serves the entire West Valley, and keeps a supply of parts on the truck so that repairs can be completed as quickly as possible. Parts are also available for sale in the store. All repair work is guaranteed. There is no extra charge for Saturday service. Serving Surprise, AZ and the surrounding areas, Henderson Appliance Installation and Repair is fully licensed, bonded, and insured to install any major gas or electric appliance. The team repairs and installs dishwashers, micro-hoods, ranges, washers, dryers, microwaves, wall ovens, garbage disposals, water heaters, and more. They carry known brands like Amana, Bosch, Five Star, Frigidaire, GEN-Air, GE, Kenmore, KitchenAid, LG, Whirlpool, Maytag, and Sharp. The company offers competitive pricing and quality service, along with free estimate and stands a customer satisfaction guarantee. Mitch’s Affordable AC & Heating and Appliance Service/Repair serves Phoenix and Scottsdale, and has more than 20 years of experience. The local, family-owned company is licensed, bonded, and insured. It specializes in air conditioning tune up, air conditioning repair, and appliance repair including refrigerators, Sub Zero appliances, ice makers, water heaters, washers, dryers, ovens, ranges, freezers, dishwashers, garbage disposals, and dryer vents, . It offers free estimates on new air conditioning units and is veteran-owned. In addition, the company provides same-day service and offers a discount to senior citizens. Located in Peoria, Peoria Appliance Repair Experts offers same-day service on repair all major brands of most appliances including refrigerators, washers, dryers, dishwashers, freezers, ovens, and ranges. There is a $20 discount coupon available online, and the estimate is free if the company does the job. It is open seven days per week, and offers access to a wide variety of replacement parts. The website offers helpful tips to keep your dishwasher and other large appliances working their very best. 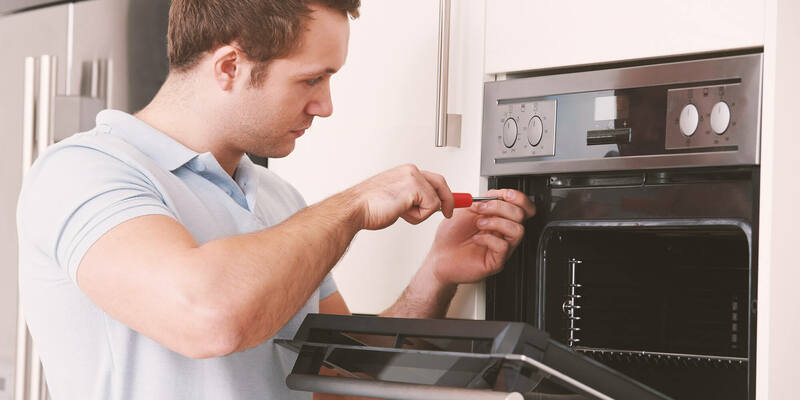 Phoenix Appliance Repair Center specializes in the repair of refrigerators, washers, dryers, gas or electric ovens, ranges, dishwashers, gas or electric cooktops, ice makers, and garbage disposals. The company offers online scheduling, same-day service, free service calls with repair, and emergency service. Technicians will always provide a written estimate for customer approval before work is performed. Phoenix Appliance Services serves customers throughout the Phoenix Valley, including, Glendale, Scottsdale, Paradise Valley, Cave Creek, Anthem, Tempe, Mesa, Apache Junction, Chandler, Gilbert, Avondale, Peoria, Surprise, and Goodyear. The team specializes in repairing refrigerators, ovens, ranges, microwaves, stoves, washers, dryers, garbage disposals, and dishwashers. They also offer a warranty on all parts and labor, and all charged are by the job, not by the hour. The company adheres to a “leave no trace” clean-up policy, and service is prompt and efficient. All service technicians are carefully screened and the company is licensed, bonded, and insured. Located in Phoenix, Professional Appliance Repair is open 7 days a week and repairs all major brands and types of appliances including refrigerators, washers, dryers, dishwashers, freezers, ovens, and ranges. The company offers same-day service, fair pricing, free service calls with repair, free estimates if they do the job, no hourly rates, and no hidden fees. Repair technicians have extensive training and expertise in their field. The company recommends and performs routine maintenance to avoid potential future problems. Family-owned and operated Ray’s Appliance Service has been serving the Maricopa County for more than 25 years. The service area includes Surprise, Peoria, El Mirage, Glendale, Goodyear, Avondale, Buckeye, North and West Phoenix, Scottsdale, and Paradise Valley. Repairs are performed in-home for most major appliances. A full estimate is provided prior to repair, and the charge for a trip with diagnosis is $49. Red & White Appliance Service specializes in the repair of high-end appliances, but services all major kitchen and laundry appliances. Family-owned and operated since 1986, the company serves the valley including Gold Canyon, Casa Grande, and Wickenburg. All employees are thoroughly background checked, licensed, and insured, and the technicians possess more than 70 years of combined experience. The technicians are factory trained and equipped to handle a range of appliance brands and models. All repairs come with a one-year parts and labor warranty, and evening and weekend service is available upon request. Valleywide Appliance Repair has been servicing the greater Valley of the Sun for more than 30 years. It can repair most large appliances including washers, dryers, refrigerators, ovens, and dishwashers of any brand. Service calls are only $55, and the call is free if you choose Valleywide to perform the repair. The technician will provide a written quote prior to doing the work. Technicians are factory trained to repair any brand of appliance. Discounts are available for senior citizens and military personnel.